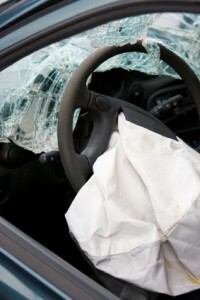 Airbags in cars and trucks are designed to protect drivers and their passengers during a wreck. However, sometimes, they malfunction. As airbag injury attorneys, we have worked with clients whose airbags failed to deploy during a crash, and with people whose airbags deployed at improper times. Either way, defective airbags can severely injury innocent people. Injuries can be caused by inferior airbag parts, poor installation, faulty design or other factors. an air bag module which contains the inflator unit and the air bag itself which is made of lightweight fabric. crash sensors which are designed to be activated by forces generated during a significant crash. the diagnostic unit which monitors the readiness of the system. unconscious and slumped over the steering wheel. unrestrained or improperly restrained and slides forward in the seat. sitting very close to the steering wheel.